I was one of those kids that stayed up way past my bedtime, fighting sleep so that I could get through my latest conquest. By conquest I mean “book,” and by “fighting sleep” I mean reading in low light and trying to keep my eyes open. I am, without shame, a nerd of the completely bookish variety. I love to feel caught up in a story, to find myself rooting for certain characters, to rush through a mystery novel to find out who-done-it. In books, I find myself deep in the midst of a foreign place or transported to the past. And I love the feeling of holding a book, turning pages as quickly as I can, seeing a book on a shelf and getting a hint of emotion over what lies in those pages. So I was reserved about jumping into the world of electronic readers. Would the lack of page-turning be a distraction? Would I miss having a tangible copy of each book I read? Was it worth the money? I can now answer these questions (the answers are no, no and yes). For Christmas this year, the Hubbs got me a Kindle. That means instead of reading those heavy, unwieldy, mildewed paper-goods that we call books, I am reading on a light, portable, delightfully easy-to-read Kindle. I have a revived interest in reading before bed, on the couch and on the bus. It is comfortable to hold and easy to manage, and I am really looking forward to traveling with it. On typical vacations, I might bring three books (a couple quick reads, and maybe one back-up in case I decide I am not in the mood for one of the main choices). Now I can load as many books as I want on the Kindle and not have to worry about the extra weight in my suitcase. The Kindle is no different than reading a paper book, in terms of how the story and characters make you feel, how the author has crafted a sentence and how I can get lost in a new world. It’s a different medium, but the pleasure is all there. I haven’t lost anything, I’ve just gained a new outlet for one of my favorite pastimes. I am still going to buy books printed on paper. I don’t think I lose anything by reading The Girl with the Dragon Tattoo on the Kindle, but certain books (example: Tree of Codes by Jonathan Safran Foer) require a tangible reading experience. If anything, having a Kindle makes me more conscientious about the printing industry, book cover design, paper quality and the value of printed, tangible publications. The future is electronic, but maybe the future also brings a certain art back to the printed object. In addition to all the free books on Amazon, Project Gutenberg hastons of good/free reading material. My current picks: Anna Karenina and The Autobiography of Benjamin Franklin. A touch screen would be nice, but I suspect that would lose some of the readability of the e-ink, which is truly easy on the eyes (especially since I am on a computer so often at work — it’s nice to read on “paper” instead of a screen). You can’t read in the dark on a Kindle (as you can on an iPad). But seriously, how often are you sitting a room that doesn’t have a light? If it really seems like a problem, buy a book light. You probably don’t need the 3G version. The Hubbs got me the wi-fi version, which is $50 cheaper and completely functional for me. The fact is, I am never in a situation where I must immediately buy something to read. I’ve stocked up on about 10 books on there, and that should hold me for a couple months. We have wireless at home (and if you don’t, you should), so I typically just log into our home network, at work or at the coffee shop. Book loaning is problematic on an e-reader. 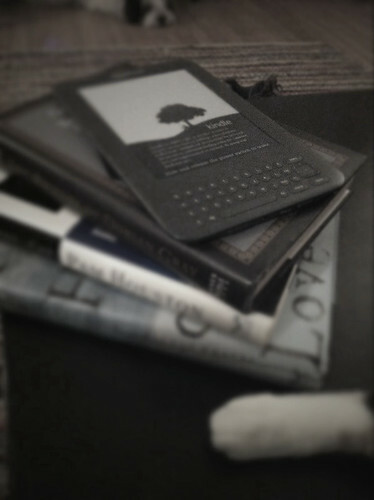 I love to share books after I’ve read them, but this is just not easy on a Kindle. Amazon is going to roll out some system to share Kindle books, but there’s a limit of two weeks for how long you can “borrow” from a friend. So there you have it, my review of the Kindle. Happy reading! Hope you’re finding yourself lost in some new world tonight, be it on an e-reader or on paper.